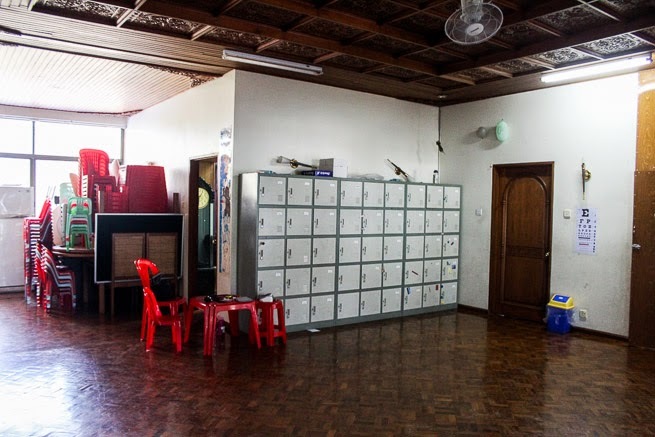 As most people know, one of the main goals during our time in Myanmar is to setup and run a medical clinic. Most of the students don’t routinely visit a doctor for checkups: visits happen when they are sick or injured. After seeing some of the medical clinics around I can’t say I blame them one bit. Our plan is to give a physical to each child and then provide medical care as situations arise and as we are capable of. 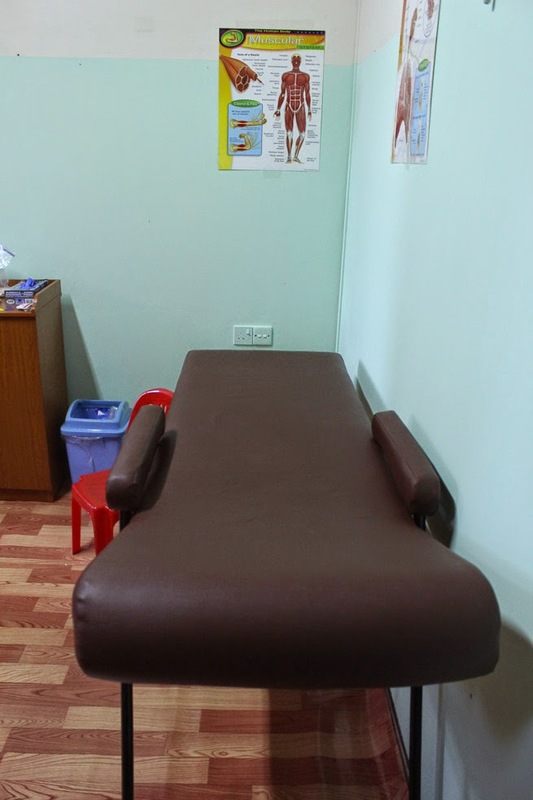 A few days after we arrived in Myanmar they had a room picked out for the clinic. They painted it, put flooring down, purchased a massage table (that is now a medical table), and put cabinets in. Dave brought over a suitcase of supplies and his Mom had left some medical supplies as well. We didn’t bring over a lot of medicines but many of them can be easily purchased here by anyone. Need Antibiotics? Great just walk down the street to the pharmacy and purchase 100 pills for $4! After a week or two of being here and getting things set up we have started seeing the kids at school. We see kids during school hours 1-2 at a time. I do triage for the kids and then Dave does a physical. For triage I check blood pressure, pulse, oxygen, weight, height, visual acuity and color blindness. The thing that has shocked me the most is that a few of the kids can’t even read the first letter on the eye chart, which means that they are legally blind (worse than 20/200). When I asked them how they were functioning and reading in class I was surprised by some of their answers. Some kids said they managed just fine! I have no idea how. One girl told me she squints until tears run down her eyes. Poor girl! The good news is quality glasses here are around $20 so the kids will be able to purchase a pair. For now we have seen the 2nd through 8th grade classes. There are 267 students so hopefully in a few weeks we will have seen all the grades. 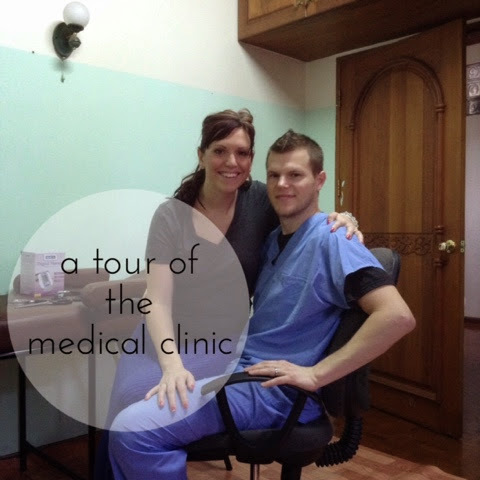 We are really thankful that we were able to start the clinic so soon. It has been a good way to interact with the kids on a one-on-one basis. We hope that we can be an encouragement to the kids and their families and we pray it will be a way God can use to show them His love and open their hearts to the gospel. Right behind the lockers is where the clinic is. 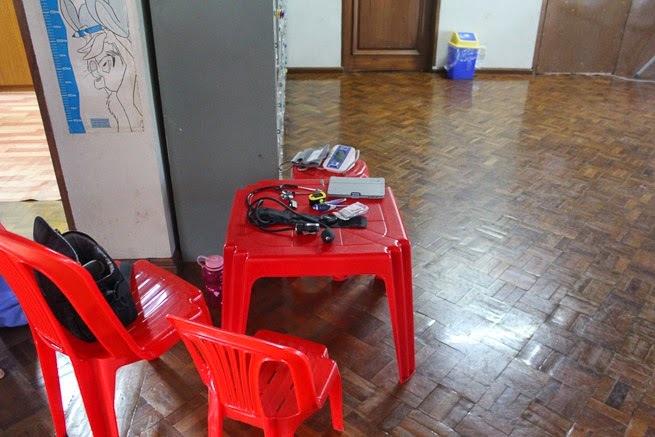 The little red table is where triage takes place. 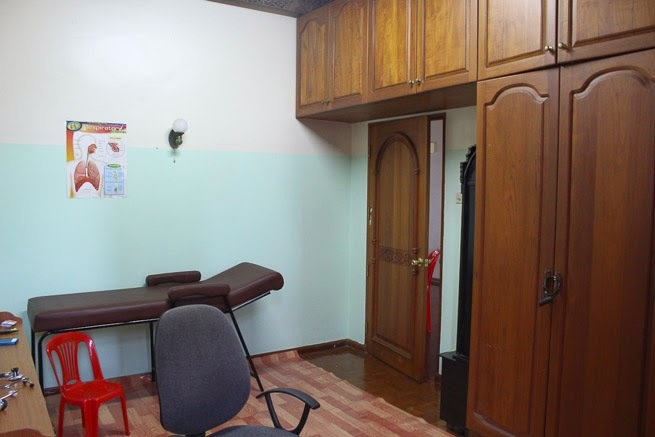 And that is our clinic! It is simple but is a great place to do what we need to. If you have any questions about the clinic feel free to ask! I’d be happy to answer your questions and share more about what we are doing here. What a great opportunity! I can tell that a lot of my students aren't wearing glasses when they should be--they'll stand up or squint to read the board. I make everything on my powerpoint presentations BIG so that they can hopefully see it. Did you guys work in the medical field in the US? Sorry, I totally can't remember. Angel may go back to working at a hospital or in a clinic sometime during our life in Asia, but medicine is totally outside my realm of education and experience. 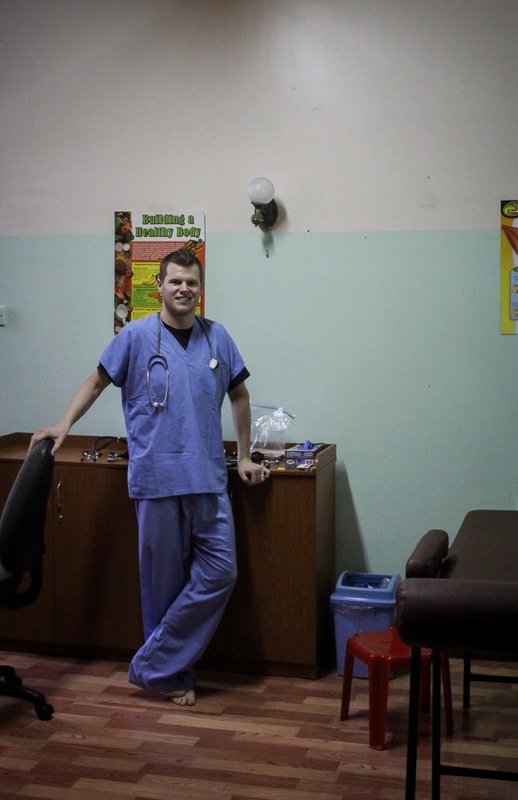 Angel does say he really appreciate the slower pace of teaching as compared to working in an ICU. This makes me think of Nicaragua! I love that the kids are getting eye exams. It is just crazy to me to think of all these people not having access to regular eye care. 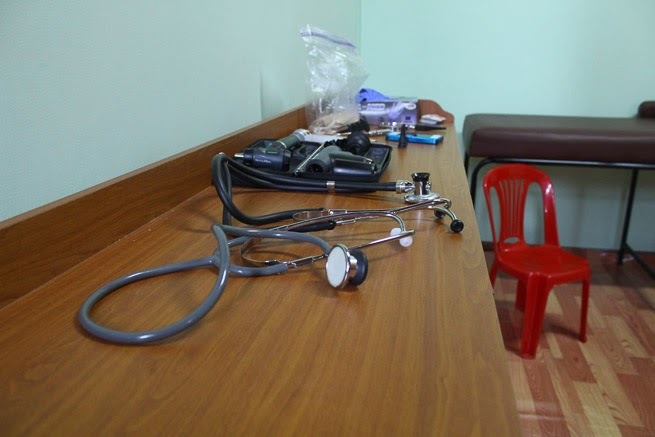 Thanks for sharing a glimpse of the medical clinic. We had people doing triage in Nicaragua, so I know what that is :) Yay! Aw! Your poor students. I feel bad for kids who can't see well. Dave worked in the medical field but I did not. My stomach doesn't sit well with that whole thing. I'm glad to help him though. That's interesting that Angel worked in the ICU. Dave has always wanted to work in the ER. Maybe when we go back home he will do that. I love your pun! Puns are the best. Most of the kids can get glasses and the parents are really receptive to them needing it so hopefully soon they will all be good to go. Thanks, Chelsea! We are thankful to get to do this. This is a lot like Nicaragua. I wonder if medical care looks similar throughout 3rd world countries. I feel bad for kids and adults who don't have glasses. Thankfully they can get them here very easily. Hi! I'm REALLY behind on blog reading, so I'm late to commenting on this, but I'm really interested in this post because it is surprisingly very similar to my work! The difference is that I don't work in a third world country, I work in a lower income area near Detroit. I do the nutrition stuff (and some of the same triage stuff as you!) but whenever kids come in to pick up new glasses I push all of my fake food stuff out of the way and I run to the front desk so that I can be the one to give them their new lenses. I LOVE the reaction that kids have when they put on their glasses and can see clearly for the first time! You guys are doing such great things for these kids. This is awesome!